Swisstime.is Panerai Luminor Automatic Swiss Replica watches look, feel and have the exact same dimensions as the original Panerai using incredible precision down to a nanometer! All watch materials like metal, ceramic, crystal, rubber, leather etc. are identical to the materials used on the genuine watch. So the weight is exactly the same with the original Panerai and all watch parts inside/out are interchangeable with a genuine part. 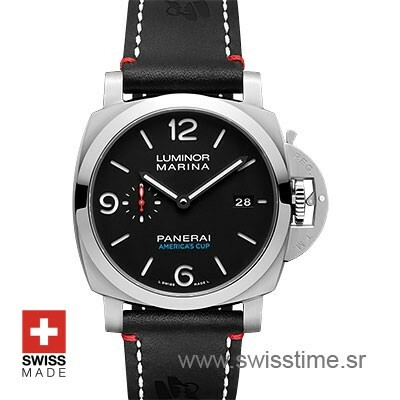 Swisstime.is Panerai Luminor Automatic Swiss replica watches looks and functions identical to a genuine Panerai. Our Swiss Cloned Panerai movements feature every Panerai engraving, serial numbering and they are lubed with Nano-oil Swiss lubricants. Designed to last a lifetime, visually and functionally our movements 28.000 vibrations per hour offers the same fine sweep seconds hand motion as on the genuine Panerai. Swisstime.is Panerai Luminor Automatic Swiss replica watches are professionally sealed to keep out day to day dirt and moisture with ABYSS Deep-Sea water Sealants and unique double core silicone synthetic ”O” Rings. The watch case back, crystal and crown are sealed with Swiss made ABYSS Deep-Sea water gaskets. All Submersible models are waterproof tested up to 300 meters! Every Swisstime.is Panerai Luminor Automatic Swiss replica watch is professionally sealed and individually water resistance tested up to 100-300 meters prior to shipping. Swisstime.is Panerai Luminor Automatic Swiss Replica watches are equipped with the new SuperLuminova™ Blue and Green glow luminescent pigment that after sufficient activation by sunlight or artificial light will glow in the dark up to 9 hours with uniform luminosity throughout. Outstanding classical lines in a replica who is identical to genuine and has the perfect fit in the wrist. Ultra durable indeed offers the ability to wear it at any time and any place above or below sea level. Qualitatevely superior replica, one of the best Panerai Luminor Merina i ever saw!!! A great replica in a great price! An opportunity that i couldn’t miss!! !